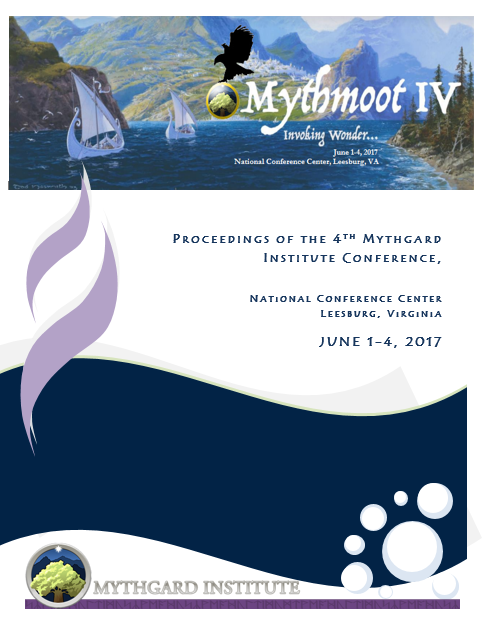 Mythmoot IV: Invoking Wonder took place at the National Conference Center in Leesburg, Virginia from Thursday June 1st through Sunday, June 4, 2017. The program included special guests Dr. Verlyn Flieger (UMD), Dr. Michael Drout (Wheaton College), John DiBartolo (Creative Guest of Honor), Ted Nasmith (Creative Guest of Honor), Sørina Higgins (Academic Guest of Honor), and Dr. Corey Olsen (Signum). Paper presentations by conference participants covered a wide range of topics in speculative fiction. It also included the traditional banquet on Saturday evening, with much food and merriment for all! Imaginative Literature – Science Fiction, Fantasy, and Speculative Fiction from Mary Shelley and H.P. Lovecraft to Ursula Le Guin and Neil Gaiman. Tolkien and Inklings Studies – Research on the works and lives of the Inklings as they interact with each other, their modern context, and classic and imaginative literature. Germanic Philology – Explore relationships between language and literature in the past, present, and future. Page through the proceedings below by clicking on the squares above the cover or check out the work of a specific presenter by using the presenter list. Happy reading! Faith and Courage: the Divergent Maturing of Irene and Bilbo / ben-Avraham, Kay. My paper treats with George MacDonald’s The Princess and the Goblin in contrast to The Hobbit as bildungsromane, examining the type of growth both books describe, and the avenues on which they send their characters journeying toward growth. The Princess and the Goblin seems to me to be concerned with growth of an inner, spiritual nature—confidence in, and relational ability with, a spirit-world—while The Hobbit focuses on an outer kind of growth: success which depends on luck, courage, and wits, and which results in the character being better able to handle himself in the wider world. C.S. Lewis, Númenórean / Bratman, David. C.S. Lewis borrowed from J.R.R. Tolkien’s legendarium for That Hideous Strength. What did he do with it? A “Fair Tale”: How Luthien Went from “Elfin Maid” to “Immortal Maiden Elven-wise” / Brierly, N. Trevor. The story of Beren and Lúthien was important to Tolkien and over the decades he wrote several versions of a poetic recounting of the beginning of their relationship. A comparison of an earlier version of this poem “Light as Leaf on Linden-tree”, written in the early 1920s and “The leaves were long” which appears in Fellowship of the Ring (1954), reveal a significant shift in how he portrays Faerie and its inhabitants and their relationship to the mortal world. This paper will explore how this shift is represented in the changes in the character of Lúthien, especially the language used to describe her, as well as the dynamics of the beginning of the relationship between herself and Beren. Lost in Beleriand: The Ilkorindi in the Lhammas and the Etymologies / Brierly, N. Trevor. The history of the Ilkorindi people and their language is part of the greater story of the response of the Elvish peoples to the summons of the Valar to leave Middle-earth and go to Valinor, as told in the Lhammas, especially §§2-3 (Lost Road 168-171), and in the Quenta Silmarillion Chapter 3 (211-219). Tolkien wrote these in the late 1930s, before beginning the Lord of the Rings, and Christopher Tolkien notes that the Lhammas, the “Account of Tongues” is closely related to the Quenta Silmarillion (107, 168). The Lhammas tells the history of the languages of the Elvish peoples whose history is found in the Quenta Silmarillion. This paper will succinctly describe the history of the Ilkorindi elves, note some similarities and differences between Ilkorin and the other Elvish languages and explain what happened to the Ilkorindi and their language and why they are almost unknown, even to many Tolkien scholars. Longing as a Theme in The Lord of the Rings and The Chronicles of Narnia / Drew, Peggy. Longing is a theme throughout the fantasies of J.R.R. Tolkien and C.S. Lewis. This paper will explore each author’s treatment of the theme in The Lord of the Rings and The Chronicles of Narnia. We will examine instances of longing in each story and ask who is experiencing it, when, towards what, and why. We will also look briefly at the historical and biographical contexts of the authors to understand personal sources of the theme. Finally we will compare and contrast their treatments and conclude with an assessment of their effectiveness in writing about longing within their Christian worldview. Tolkien Reforges Bilbo’s Ring into the One Ring / Fisher, Timothy. I collate here the quotes illustrating the process of going from the hobbit Bilbo’s Ring to Sauron’s One Ruling Ring of Power as the focus of the “New or Second Hobbit Book” (aka LotR) and dare to draw some conclusions that presume to imitate Tolkien’s propensity to imaginatively, but reasonably, fill in gaps in the literature of myth and legend. In order to restore – to vivify — an early story for modern man… which is exactly what another earlier myth-maker (Wagner) did for his and our culture. ‘Vocation’ in The Lord of the Rings / Fortunato, Paul. Characters from Frodo and Sam to Aragorn and others express some sense of being called, of having a vocation to some transcendent endeavor. These are not mere “choices.” Tolkien suggests that, if one opens oneself to wonder and mystery—things not controllable and containable within purely rational structures—one sees one’s agency in a wholly new light, in terms of vocation. Tolkien thus straddles medieval and modern conceptions of human agency through his fiction. One way of characterizing this idea of human identity and agency is as in terms of narrative conceptions of identity, as theorized by people like Charles Taylor and Alasdair MacIntyre. Weavers of Peace and Strife: Traditional versus Monstrous Femininity in Beowulf / Fox-Lenz, Alicia. Many scholars have split the six named female characters in Beowulf into three main groups: the cup-bearers, the peace-weavers, and the monstrous. Two of these three designations represent aspects of the traditional role of women in Anglo-Saxon society — a central, civilizing influence on tribal societies plagued by clan wars — while the third is a subversion of that traditional role, argued by some to be an allusion to the Old Norse Valkyrie tradition. We will explore the traditional roles versus the subversion of them within the plot and in historical context as well as compare each role’s successes and failures. The Feminine Child Hero / Heit, Alexis. Female literary characters must overcome more obstacles than their counterpart male character; these obstacles, however, are not limitations that restrict the female child heroine. Instead, the main obstacle in comparison with other literature is of being female in children’s literature. The female child hero is at the beginning of the hero path and therefore presents the challenge of how to overcome opposition at a much earlier age. Children’s fantasy literature brings out the identity of the child hero, and not just the identity of female or male; but an analytical look at the child character to become the hero. The Unquiet Vampire / Heit, Alexis. John Polidori’s The Vampyre: A Tale was written in 1819 and considered to be an origination in to the romantic vampire genre in fantasy fiction. James Francis Child collected a ballad with various different stanzas thought to date from 1400; he entitled it “The Unquiet Grave” then added it as number 78 among his collection in 1868. The short story echoes the reanimated revenant of the dead lover returned from the threshold of death to dissuade the grieving lover from initiating unnatural conditions upon life for unrequited reasoning, such as a suicidal death or even threatened violence. The connection is not the vampiric discrepancies, but the similarly unusual demands between living life and eternal death. A Very Brief Introduction and Invitation to Consider the World’s Oldest Extant Written Mythopoeic Traditions: Ancient Myths of the Fertile Crescent / Hensler, Kevin R.
The myths of the ancient Fertile Crescent had a very long and rich history. Intertextual relationships among these texts are clear, though the exact nature of these relationships, extant instantiations of which are often separated by as many as 2000 years and hundreds of miles, is usually very difficult to define. This paper was intended to allow me to present to the Mythgard community a little bit of what is going on in this fascinating field, while discussing a few of the texts I find most interesting. Some knowledge of these myths when studying Norse, Classical, or other mythologies is invaluable, as well as when studying those who reworked ideas from such traditions, like Tolkien and Lewis, should prove invaluable. These myths are also fascinating in their own right, and I think it is a shame the only exposure many of us ever get to them is a few words about Gilgamesh in a World Literature course spoken someone who really does not know much about the work. I hope this paper does little justice to this topic. “She Died” – The Choice of Luthien and the Destiny of the Elves / Hillman, Thomas. Peter Jackson’s reduction of the Lay of Leithian from the sublime ‘And long ago they passed away / In the forest singing sorrowless’ to the ridiculous ‘she died’ has incited much scorn outside the cinema. Yet it is not without its uses. For this limited perspective invites us to question our own, in which we forget that the Lay is not a Human, but an Elvish story. Viewed thus, and in connection with The Tale of Aragorn and Arwen, the Lay offers the Elves hope beyond the ending of the world, which is the natural limit of their existence. On the Nature of the Dunedain / Hulick, Evan. Who are the Dúnedain? Are they merely a race of endowed humans from Númenor and, later, Gondor and Arnor, or something more? Through a New Critical lens, this paper will examine the Dúnedain as they are presented throughout Tolkien’s published Silmarillion and The Lord of the Rings. The term “Dúnedain” does merely not refer to a race, but especially to a moral ethos that is expressed by Faramir to Frodo in The Two Towers, embodied by Aragorn, and it is for the sake of this ethos, not only for that of lineage, that Aragorn’s claim to the throne is justified. Cinematic Subversions: Red Riding Hood and Into the Woods / Johnson, Thomas. This presentation will offer a counterpoint to a common criticism of Rob Marshall’s 2014 film version of Stephen Sondheim’s and James Lapine’s 1987 Broadway musical Into the Woods. It will argue that Marshall’s decision to cast an actress in the role of Red Riding Hood who is significantly younger than her theatrical predecessors accentuates the subversive qualities of the character’s storyline, rather than undermining them. The presentation will demonstrate how Lilla Crawford’s onscreen portrayal of Red Riding Hood, and Marshall’s framing of that performance, invite young moviegoers to empathize with the character and to grapple with moral ambiguity alongside her. Gaiman’s Cat: Quantum Reality and The Sandman / Larsen, Kristine. In a famous passage from American Gods, Sammi Black Crow offers “I can believe that light is a particle and a wave, that there’s a cat in a box somewhere that’s alive and dead at the same time….” (394). This reference to the (in)famous Schrodinger’s Cat thought experiment is the starting point from which this paper will examine the complex interplay between experience and reality in the quantum cosmology of The Sandman graphic novel series, with special attention paid to the role of dreams in creating and destroying realities. Data Analytics as a Form of Storytelling / Morgan, Jeremy. Data. The term conjures up images of reams of paper full of figures or of rows and rows of calculations in Excel Hell. Neither image is flattering. I argue that far from being dry, dehumanizing, and mechanical, effective data analysis is actually a form of storytelling. Drawing from essays by J.R.R. Tolkien and C.S. Lewis as well as from N.T. Wright’s work on the mechanics of stories, I show that when data is used properly it takes the “reader” on an adventure. The job of a data analyst is not merely to be a number cruncher, rather it is to be a storyteller. What is the Weight of a Linden Leaf? / Neville, Katherine. “Light as Leaf on Linden-tree,” first written around the end of 1919, tells in nine stanzas of the meeting of Beren and Tinúviel. The format of the poem introduced subtle changes to the lovers’ tale, and its introduction into both “The Lay of the Children of Húrin” and The Lord of the Rings produced a ripple effect which flowed through much of Tolkien’s entire legendarium. My paper will follow the flight of the linden leaf throughout its history, highlighting the ways in which Tolkien used this little poem to deepen each story it touched. Wonder Tales: the History and Myth of Appalachian Folklore in Oral History / Parrish, Emma. Lee Smith’s Oral History is a fictional family saga about the Virginia Appalachians. It is full of references to Appalachian mythology, superstition, and folklore—commonly referred to as wonder tales. Using extensive research of real Appalachian oral histories, this paper will explain that many of the mythological elements of Oral History are, in fact, true Appalachian folklore. Additionally, it will explore Appalachian ideas of what is myth and what is truth. This paper deals with a less popular sort of mythology, but one that invokes wonder nonetheless. What Time Has in Store: “Edwenden” and Heroic Action in Beowulf and Boethius / Rohlin, Richard. The idea of edwenden, the “sudden reversals of time,” is the most persistent theme in the Beowulf poem, used both to create narrative and to cast its heroes and monsters into stark relief and reveal the true measure of their character. This paper looks at the nature of edwenden and the related concept of wyrd within the poem, and particularly at how both are treated in Hrothgar’s “sermon,” which provides the measure by which responses to edwenden may be judged. Instructive parallels are found in the complex treatment of these concepts in the Old English Boethius as we examine the question of heroic conduct in the face of inevitable change, applying both Hrothgar’s and Boethius’ standards to the final act of the poem’s hero. Female Vampires in Buffy and the Southern Vampire Mysteries: a Character-Network View / Smith, Laura Lee. Like Dracula, Interview With the Vampire, and others before it, Buffy the Vampire Slayer has itself become a reference text for later transformations of vampire folklore. This paper compares BtVS with one of its successors, the Sookie Stackhouse series, as both feature a superpowered human female hero who becomes involved romantically with male vampire love interests. The particular area of focus is social network analysis of female vampires in (selected installments of) each series, with a focus on dialogue “connections” with other characters. In particular, since the female vampires are not romantically connected to the female heroine, how well integrated are they into the story as a whole, and how fully fleshed out are they as characters, whether cast villains, allies, lovers, friends, or otherwise? Breaking and Liberating: the Harrowing of Hell Motifs in The Simarillion, LOTR, and Le Guin’s Earthsea / Steed, Robert. This presentation will focus upon the ways in which Tolkien and Le Guin incorporate and rework medieval “Harrowing of Hell” motifs in various episodes of their work, especially upon Luthien’s liberation of the imprisoned of Sauron’s Tower, Gandalf’s liberation of Theoden in Meduseld, Aragorn’s liberation of the dead in the Paths of the Dead, Ged’s liberation of the dead in The Farthest Shore, and the breaking of the wall of the dead in The Other Wind. A Data-Oriented Approach to the Battle of Five Armies / Weiss, Noam. It has been observed that, in The Hobbit, the battle of five armies is stylistically different from other parts of the novel. I am going to take a data-oriented approach, and use computer science and big data tools, to see if and how the vocabulary of the battle of five armies differ from that of the rest of The Hobbit. In particularly, I am going to look at the possibility that the vocabulary of the battle of five armies is composed of words with older origins than the rest of the book. “An Encouraging Thought”: the Christian World View of Middle Earth / Williams, Donald T.
There are at least five ways in which the biblical worldview is central to the plot of The Lord of the Rings. First is the way Darkness and Light interact symbolically in the story; second, the way what we can call “the strength of weakness” advances the plot to the point that we can’t help but hear echoes of the biblical statement “Not by might, not by power, but by my Spirit, says the Lord” (Zech. 4:6); third, the role of Sacrifice in the victories that are achieved; fourth, the hints of Providence, of a guiding Purpose behind supposedly chance events; and finally, the presence of what I am tempted to call Christ Figures. Together they add up to a story that resonates powerfully with a biblical view of life and the world. Creative Presentation: The Flower of the Cedar, Excerpts / ben-Avraham, Kay. “The Blight” / Montesano, Craig. A waterman, Owen Cadell, struggles to understand a blight that has befallen the lower Potomac River, robbing it of oysters that were once abundant. A village slowly dies before his eyes, as if suffering from some terrible curse leveled against it. All the while, Cadell is haunted by rumors of a great battle between two ships on the river that no one can recall. “The Blight” is original— and, as yet, unpublished—fiction in the folklore genre that weaves together feigned Civil War history, language, and mythology of the sea in one man’s journey to recover memory and identity. This presentation will critique the story and its employment of elements used by J.R.R. Tolkien in Lord of the Rings and will explore parallels between Tolkien and American writers (in particular, Larry McMurtry) who have created folklore and heroic fiction uniquely American in its foundations and flavor. The presentation will also include a discussion of Tolkien’s dream of presenting England with a mythology, how that noble sentiment inspired “The Blight,” and why it is also relevant for American artists living in the present age. Apprentice in the Wild / Painter, Mark. The Inklings, In Memoriam: a Cycle of Poems / Williams, Donald T.
Nine poems in various forms (sonnets, villanelles, ballad stanza, etc.) remembering and commenting on the Inklings (mainly Lewis and Tolkien) and their work. This poetry reading was very well received at the Taylor University C. S. Lewis and Friends Colloquium last summer. Mythmoot IV Proceedings (2017) by the respective authors is licensed under a Creative Commons Attribution-NonCommercial-NoDerivatives 4.0 International License.